No matter how many pies, cakes and cookie platters were served at Christmas dinner, our mom always put out one more dessert: fresh fruit salad. It always had takers, from calorie counters to healthy eaters to people avoiding lactose, gluten, refined sugar, whatever, to people who were too full to eat something rich. But as much as we treasure memories of mom sectioning all types of citrus for her fruit salad, this strawberry wreath is an even better idea. 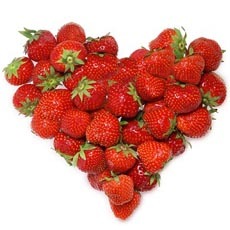 Buy four or more pints of strawberries with fresh green crowns (your grocer may have jumbo value packages). Wash and pat dry, leaving the crowns intact. If the crowns are dried out, remove them and accent the berries with some green grapes instead. 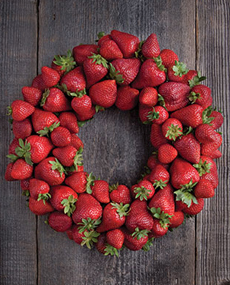 Lay the berries out in a wreath shape on a tray or cutting board. Cover with plastic wrap to keep in the moisture until you’re ready to serve the wreath. This is the easiest Christmas fruit dessert. Photo courtesy California Strawberries. heart. Photo courtesy WeHeartIt.com. You’ll get oohs and aahs plus voices of appreciation. If the berries aren’t sweet enough, provide a bowl of sugar and noncaloric sweetener, or a squeeze bottle of agave or honey. We actually sprinkle Splenda over the berries before plating them, which solves the problem. But not everyone likes the idea of artificial sweetener. We wish you a berry happy holiday! *You can use any vanilla yogurt, but Siggi’s is one of the lowest sugar vanilla yogurts on the market.